Makeup trends come and go, but red lips are forever. There is something universally flattering about this French girls’ secret makeup weapon that keeps this ultimate makeup item in fashion for many years. Personally, I can’t stop having butterflies in my stomach every time I see a new perfect shade of red released. Needless to say that over the years my collection of crimsons, scarlets, and blood-reds grew dramatically. 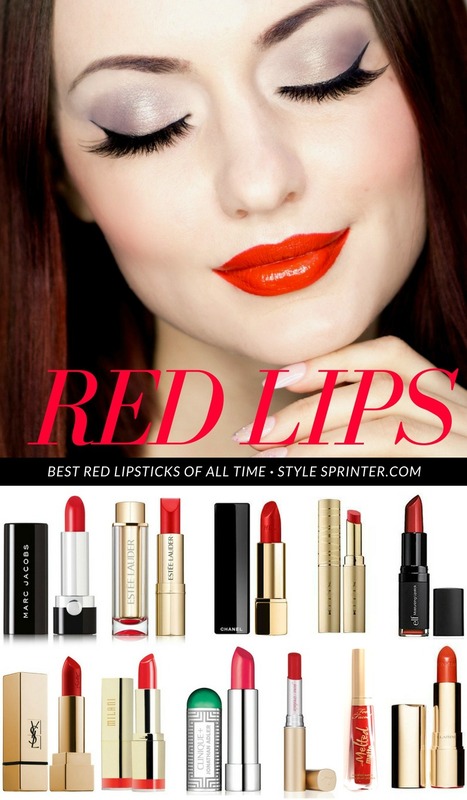 In this post, I’m rounding up the best red lipsticks I have in my makeup collection. Too Faced Melted Matte Liquid Lipstick in Lady Balls // That perfect shade of cherry red is the most loved in my collection. I already repurchased it twice and will continue doing so religiously. Estee Lauder Pure Color Love in 300 Hot Streak // New favorite scarlet red that I found during my recent trip to Europe. Perfect for matte finish lovers who appreciate chic makeup packaging. Clarins Joli Rouge in 741 Red Orange // The shade I used for the cover photo of this post that offers comfortable wear and hydrates lips throughout the day. YSL Rouge Pur Couture in 01 Le Rouge // The most glamorous lipstick in my collection that kills it from all fronts – luxurious packaging, ultimate shade vibrancy, and superior quality of coverage. Clinique + Jonathan Adler Pop Lip Colour in 25 Capri Pop // Favorite lipstick formula that became even better in this limited-edition packaging by Jonathan Adler. Juicy, vibrant red that really pops! Milani Color Statement Lipstick in 53 Empress // By far, the most luxurious drugstore lipstick. It looks, feels, and lasts like a high-end product – for just a fraction of the price! Jane Iredale PureMoist Lipstick in Gwen // For all the vegans of this world, consider this all-natural lip product that tastes and looks amazing – and is proven to smooth even chapped lips. Lipstick Queen Lipstick Chess in Queen // Full-coverage lovers will appreciate this borderline burgundy shade of red. It’s rich, it’s full of nourishing ingredients, and it looks so hot! e.l.f. Moisturizing Lipstick in Red Carpet // This versatile shade of maroon red is a perfect everyday lipstick as it’s easy to pop on without even looking in the mirror – the formula just glides on. Marc Jacobs Lip Crème in 200 Oh Miley! // The rich formula and velvety finish of this lipstick offer comfortable long-lasting wear and an impressive color outtake. Revlon Super Lustrous Lipstick in 740 Certainly Red // The creators of this lipstick really knew what they do while naming it – the lipstick indeed turned out so high-quality that it’s hard to believe it’s from an affordable brand. Chanel Rouge Allure in 104 Passion // I wrote about this lipstick when I just started my blog and nothing changed since that – this deep ruby reminds my favorite classic shade of red for many years. Stila Matte’ificent Lipstick in Bisou // My absolute favorite fall lipstick color! Deeper and velvetier than the rest of the lipsticks in this guide, it ensures precise application and long-lasting wear. Revlon Ultra HD Matte Lipcolor in 635 HD Passion // The absolute best drugstore liquid lipstick formula that is a dupe to Burberry Lip Velvet Matte Lipstick, but much more affordable. Maybelline ColorSensational Lipstick in 691 Rich Ruby // If you are looking for a long-lasting cream formula, look no more: this firebrick shade of red is simply perfect! There you have it: a roundup of my favorite red lipstick of all times. I wonder if you found any of your favorites in this list? If so, please mention it in the comments area below. I also look forward to hearing about your favorite shade of red lipstick!